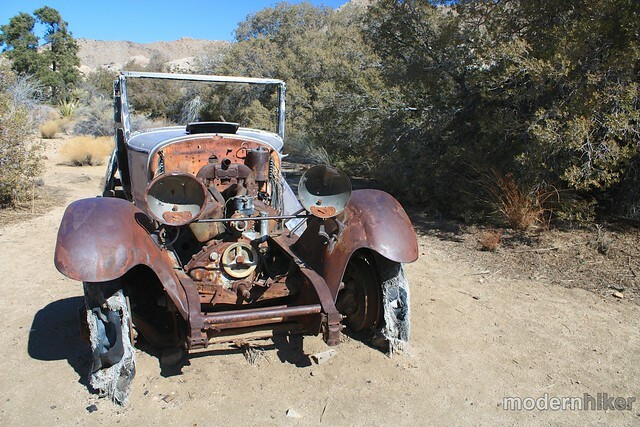 This easy 3 mile out-and-back to the Wall Street Mill and Wonderland Ranch highlights some of the prospecting history of Joshua Tree National Park and includes a visit to Bill Keys’ Wall Street Mill – the best preserved gold stamp mill in the region. 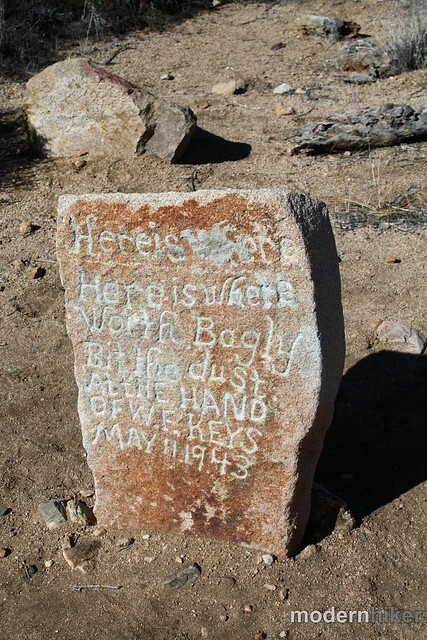 If you’ve visited nearby Barker Dam or Hidden Valley, then you’ve already become familiar with the colorful rancher / prospector / desert character Bill Keys. 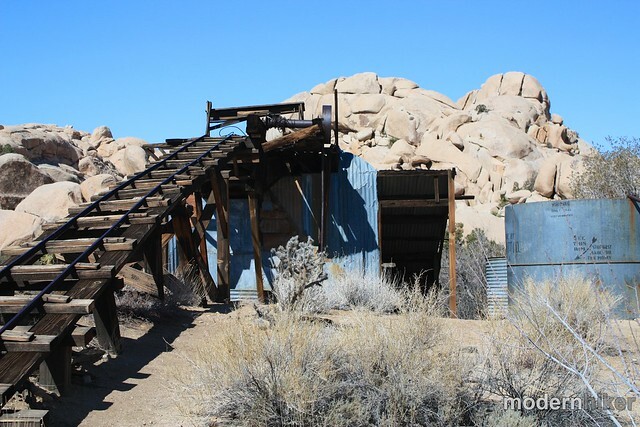 The Wall Street Mill was another one of Keys’ local businesses – and was the most modern and accessible gold stamp mill in the region at the time. Today, the Mill is the region’s best preserved, and all it takes to reach it is an easy, flat hike. 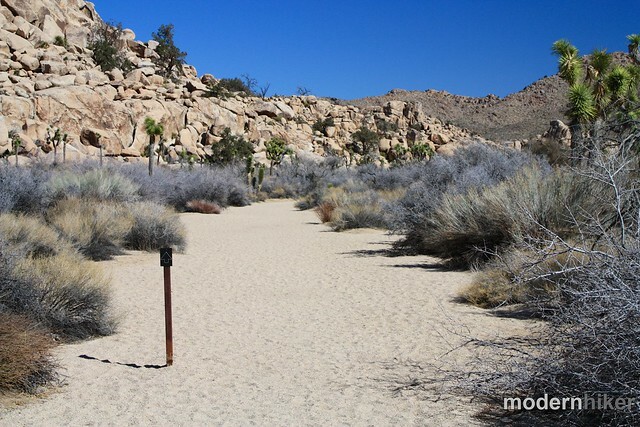 Start off at the same parking area you’d use to access the Barker Dam Loop but look for the clearly marked sign for the Wall Street Mill. 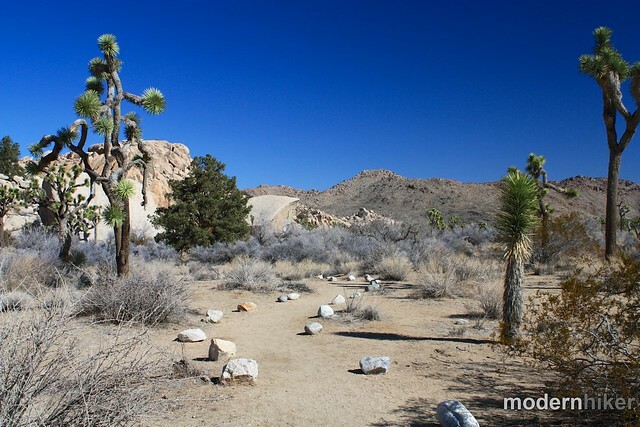 Instead of heading toward the rock formations, you’ll veer off to the east on a stone-marked dirt path. The trail enters and exits a few washes early on, but it’s clearly marked and very easy to follow. In about 0.3 miles, the trail reaches a secondary parking area. Look for a clear path to your left near an old bike rack and continue hiking. A few dozen yards down this path, you’ll notice a fork in the road. 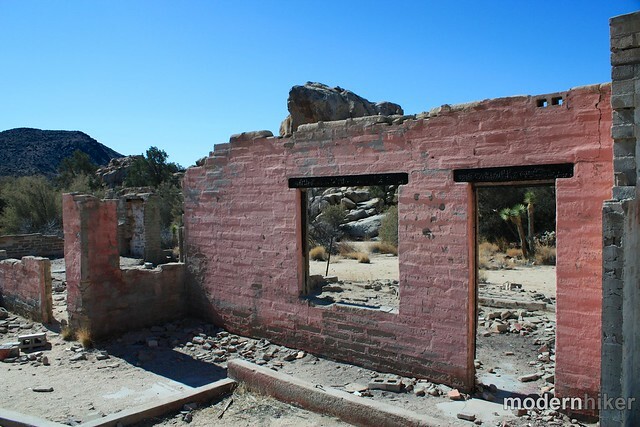 If you’re just set on seeing the stamp mill, continue straight – but chances are you’re going to spot the ruins of an odd, pink building to your left and your sense of desert adventure is going to get the best of you … so go for it and head there first. 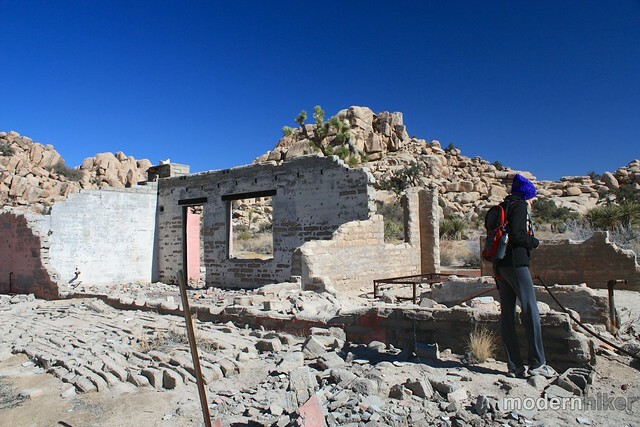 These are the ruins of the old Wonderland Ranch. Feel free to explore the remaining walls and foundations, keeping an eye out for old tin cans and other odd items. Appreciate them with photographs or memories — not by moving or taking them. 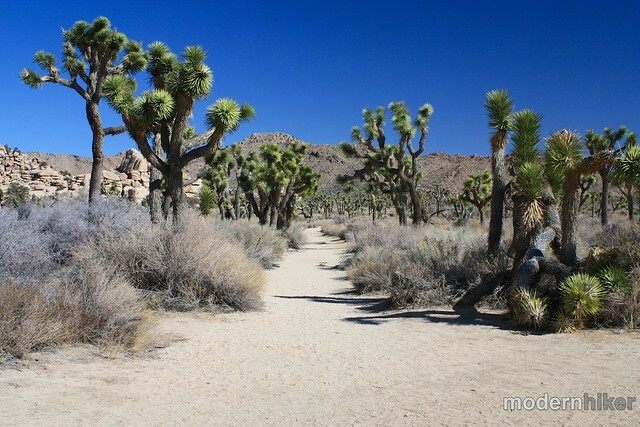 In recent years, Joshua Tree National Park has experienced an increase in visitation that has unfortunately come with an increase in vandalism and graffiti. Please remember to leave these places as you found them for future visitors. In the past, the Park and Forest Service have closed or destroyed ruins that were seen as attracting too much negative attention. Don’t let vandals ruin this incredible landscape. 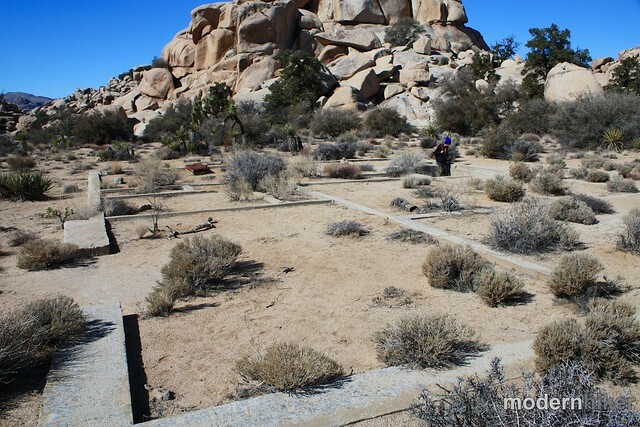 There is a trail leading into a wash directly behind the ranch ruins, where you can see an old “natural icebox” storage bin and a mortero used by the natives. This route will also take you to the “Superdome” climbing routes if you’re inclined. 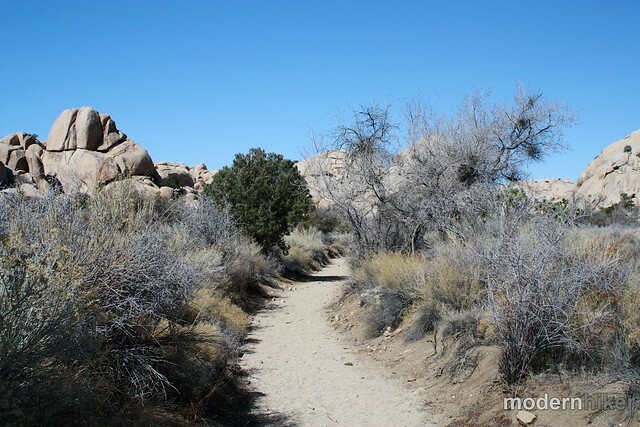 If you’re not, then continue on the faint use trails hugging the rock formations as they make a gentle bend to the east. 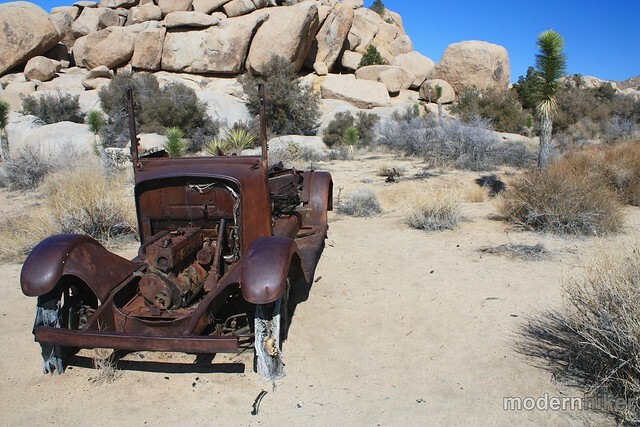 Soon, you’ll reach the ruins of an old truck, just sitting in the middle of the desert. From here, you can either backtrack south a bit to return to that main dirt path, or take an interesting side trip. You’ll notice a faint dirt route heading north, but only when you stop to take a look at the identical parallel route will you realize it’s all that remains of an old road. In about 0.3 miles, you’ll reach another set of ruins – this one just the foundations. There is a small, narrow staircase leading into an uncovered root cellar. Otherwise, it’s a pretty cool place to hang out and envision a much wilder, not-too-distant past. Backtrack along the road past the ruined truck until you meet up with the main path again. Now, take a left to continue east. You’ll pass an old water well on the south side of the road, and at about the 1.6 mile mark, you’ll spot a small carved stone marker on the left side of the path. Needless to say, Keys was sent to San Quentin Prison for seven years … before being paroled and returning to the area. (Keys was eventually pardoned six years later after establishing the shooting was in self-defense with the help of Earl Stanley Gardner, author of the Perry Mason novels). Hey, nobody ever said desert history wasn’t interesting! Continue along the path for another 0.2 miles, where you’ll reach the ruins of the old Wall Street Mill. The Mill itself is in extremely good shape – and although it’s fenced off, you can make out a lot of the old machinery. 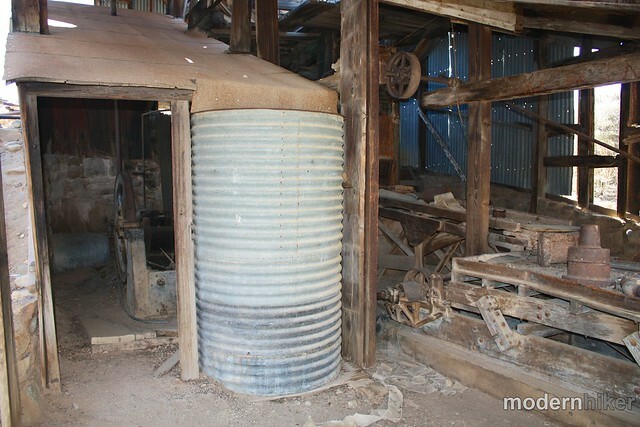 You can walk around the entire site, but please – don’t enter the mill or take anything you find. 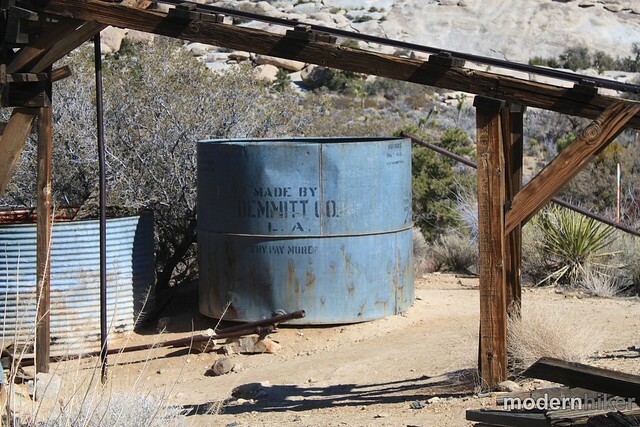 The area is on the National Register of Historic Places (and any old mining areas can be extremely dangerous). A plaque near the front of the mill does a nice job of explaining exactly how the milling process works in gold mining. When you’re done exploring the area, head back the way you came in, staying on the main path to return to the trailhead parking area. Good. If you're just heading to the Wall Street Mill and back, the trail is pretty easy to follow. 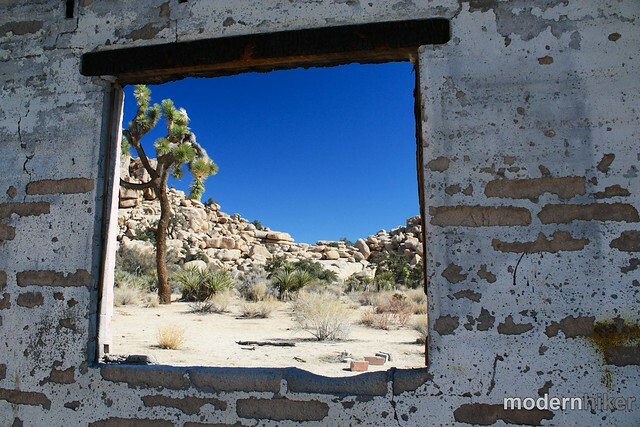 If you're interested in exploring the ruins of Wonderland Ranch, you'll need to do a little bit of cross-country traveling. 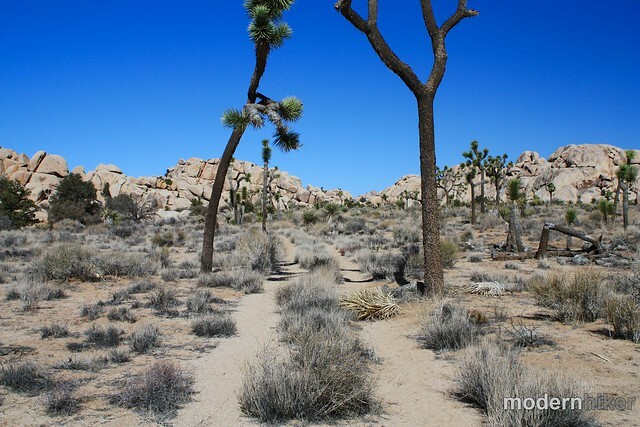 There are usually visible landmarks, but you might want to have a map on hand if you're not used to walking off-trail in the desert. 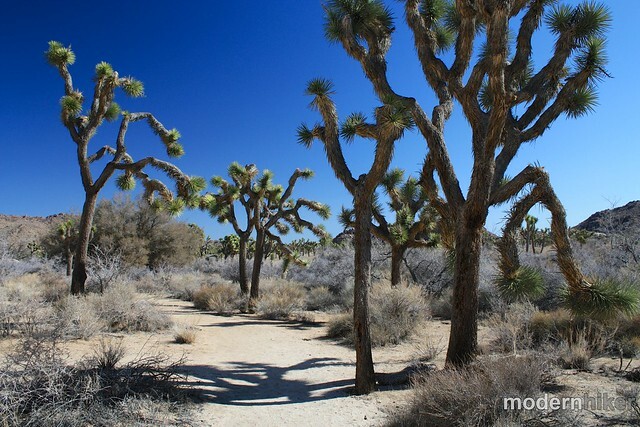 From the town of Joshua Tree, enter the park's West Entrance and travel 13.8 miles until you see a sign for Barker Dam and the Keys Ranch. Turn left and continue another 1.6 miles on the paved road and park at the trailhead for the Barker Dam Loop. You will also see signs for the Wall Street Mill near the toilets. It will be uncomfortably hot, barring a freak, late-spring storm. Is it open in June or is it just too dang hot then ?? 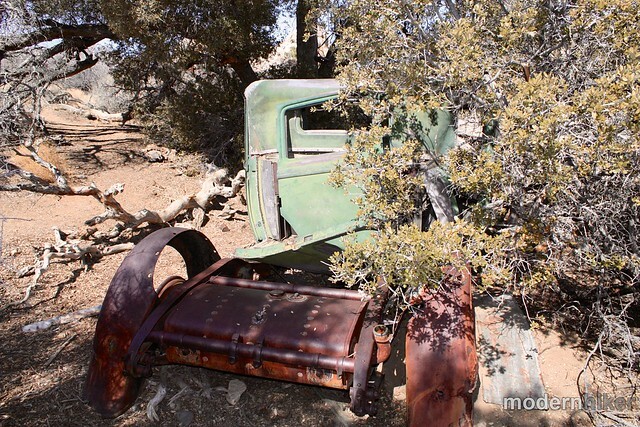 Am wanting to hike out and take pictures of the old trucks...Are there many out there? Pretty much just want to see all of it but those are intriguing! I know exactly which windmill you're talking about! It's easy to get turned around out there - especially with all those climbers' trails leading to good scrambling rocks. I'm glad you still managed to find some good desert discoveries - and hey, at least now you've got an excuse to go back for a second hike! 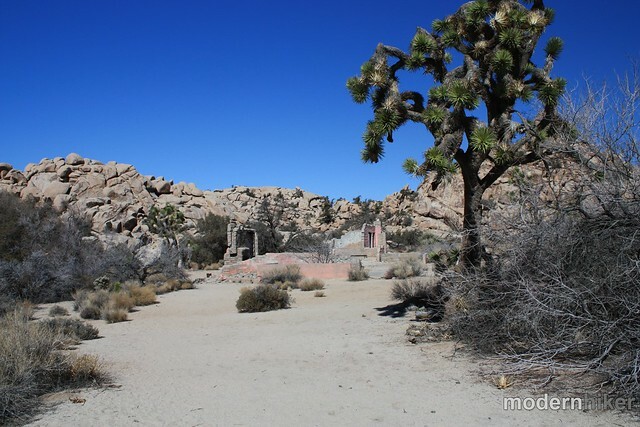 I did this hike on Sunday and really enjoyed it- however I went off trailing and missed the wonderland ranch and "memorial" plaque :( however, I did find an old windmill and some other ruins-- have you seen those out there? Really neat!